Pat Robertson's meds need adjusting again! The alleged Christian televangelist on Monday called for the U.S. to get back into the political assassination business and to start with Venezuelan President Hugo Chavez. It's not that the preacher's gone all blood-thirsty or anything like that. It's just that he's been checking out the cost of the war in Iraq and has concluded that assassinations are a more cost-effective route. God forbid! Gotta keep those SUV's rolling! Don't want to try that on $4 per gallon gasoline, now do we? In other words, Pat wants to have Hugo whacked! Maybe Pat cold get some of his business associates to do the job, since the CIA is so unreliable these days? Four More Years in Iraq? Hagel says 'Get Real! Get Out! There is a military disaster unfolding in Iraq. The war that was sold to the American people based on lies and fixed intelligence is now threatening the core functionality of the U.S. military. The facts are so compelling that even clear-thinking Republicans are calling for the U.S. to get out. Democratic Senator Russ Feingold of Wisconsin called for all U.S. troops to be out of Iraq by December 31, 2006. He became the first Democrat to call for a complete U.S. withdrawal. This weekend, Army General Peter Schoomaker said the Army has begun planning for 2009 and that those plans call for 100,000 U.S. troops in Iraq at the end of the second Bush/Cheney term. Hagel described the Army contingency plan as "complete folly." Well, at least the 256th will be back. But, if Senator Hagel is right about those numbers, how long will it be before they are sent back to Iraq? With the growing number of us FED UP with current happenings, and Yahoo not being that easy to reach all that we want to reach, THIS is our new BLOG. 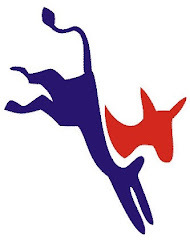 This blog is intended for members of the Democratic Party of Acadiana to SOUND OFF, Post News Stories with Comments, post commentaries and really just SOUND OFF whenever you want. Specifically, my hopes are that this blog will be used to relay much needed news stories that are NOT getting reported locally, and that we really must get out there. This is a POLITICAL BLOG, so let's try to keep our messages on Political issues, and hopefully gear them all to Louisiana and hopefully acadiana. Lastly - let's all play nice. By opening this up, surely we will get those that do not agree with us. Lets show the WORLD that we can have a good - FACT BASED arguement and steer clear of character assasinations and name calling - we can leave that to the Republicans. Enjoy - have fun... and let's change the world!